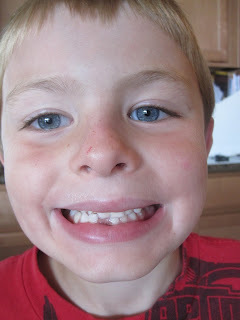 Here is Carson's new smile. This morning he woke up at 5:55, came in my room and kept saying the tooth fairy didn't come, the tooth fairy didn't come. Well, of course it was still dark. I sent him back into his room with my phone as a flashlight. He found $2.25 sitting on his desk. He was so excited the tooth fairy came! !